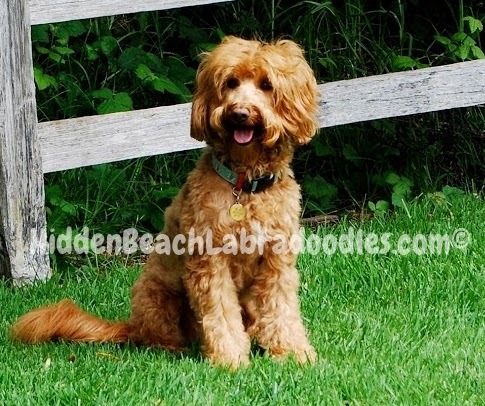 Hidden Beach Australian Labradoodles is proud to be breeding quality miniature and medium Multi/Generational Australian Labradoodles. These puppies are asthma/allergy friendly and non-shedding, which make them the perfect family pet. They are sweet, playful, and highly intelligent, which makes them easy to train. It seems their purpose in life is to make us happy. Our mission at Hidden Beach Labradoodles is to maintain the integrity of the Australian Labradoodle. We strive to breed the strongest, healthiest line possible. We have completed every health test available for our dogs. Our dogs are family pets and will remain with us for their entire lives. We only breed our dogs once a year for a total of three times to ensure the quality of life these gentle, beautiful dogs deserve. Hidden Beach puppies are born in our home and always remain indoors with us. They are integrated into our family life at the age of four weeks. At this time they are moved into the hub of our home and are a large part of our extended family. Each puppy gets one on one time daily, with me. These puppies are completely socialized and ready to join their new families at eight weeks of age. Before adoption day the puppy will have been dewormed and will have had all the age appropriate vaccinations. We look forward to working with all of our families in the future.